Hopefully by now many of you are having fun creating with your Only You January Kit. After creating a few layouts, I still had a bunch of kit pieces and thought they would be perfect on a Valentine banner. Banners are one of my favorite things to paper craft because they come together quickly and add a fun touch of decor. In addition to using the main January kit, I also used pieces from the You and Me add-on. The Pink Paislee Paper Goods had a great selection of little hearts and arrows that made layering up little embellishments really easy. The Fancy Pants Die Cut cards in the kit are one of my favorite embellishments this month. They come as plain tag board which looks great at it is, but it is also perfect for misting or painting to make it any color to match your project. I pulled out three Heidi Swapp Color Shine Mists from my stash (in Bronzer, Primrose and Tropicana Teal) to mist the Fancy Pants cards. 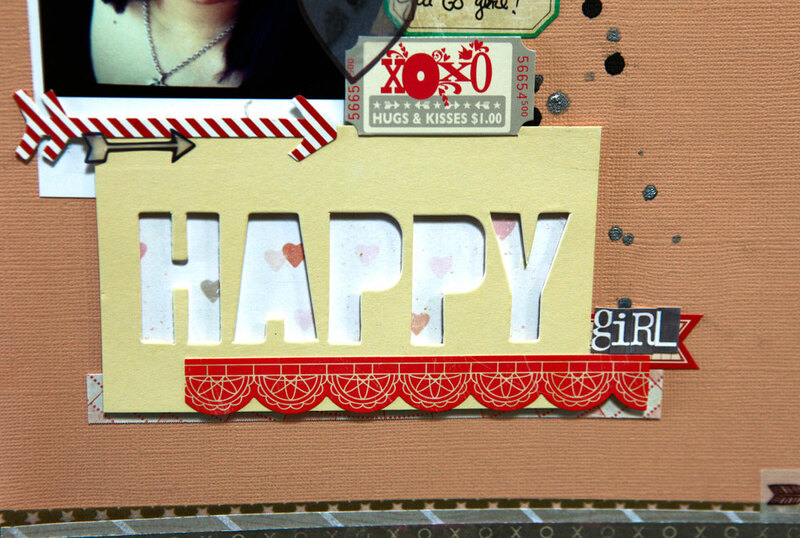 The “happy” letters were punched out from one of the Fancy Pants die cut cards. I love that the cards give both letters and the negative space with the word. I used an Elle’s Studio tag from the add-on as one of the banner pieces. It was fun to mix up the traditionally shaped banner pieces along with some tags and little tickets. For the base of my banner pieces, I used a 1959 dictionary from my grandma. I love that I have something that belonged to my grandma on display in my home! I used the Glitz Designs Paper Garland from the main kit to attach all of the banner pieces. I laid the pieces out in the order I wanted them and then set the garland right above the pieces. I then dotted tacky glue onto the banner lining up the glue with where the garland would be placed. This was a fun project that only took a couple of hours from start to finish. So if you are looking for a way to use up the last bits of your January kit before your February kit arrives, you may want to consider making a banner! I plan on this being the ONLY layout in the page protector so that one can look at the front and flip to the back to read the journaling without pulling it out of it’s protector. I liked this idea SO much I might just have to do that in the future because sometimes the story behind the picture is JUST that good! Diana used the bag as a layer behind her cutout title. So cute! Did you go Diana’s route and use the bag like patterned paper? Or did you use the bag in a more functional way? We would love to see! Be sure to post your projects on our Facebook page and we will come take a look. Have a great day! Have you scraplifted yourself recently?! Good morning! Ursula here today sharing got a happy page to share with you using our Only You and You and Me kits from this month. My efforts for this page were about creating a fun base on the left side of the page that takes advantage of the variety of tapes, garland and patterned papers in the kit. I started by using the star mask from the Stars Were Gleaming December add-on. I then printed a polaroid style version of my photo. Then it was a matter of layering strips and tapes together. I love that I’ll be able to use the tapes included in the kits in the months to come, don’t you! Have you learned to layer and cover up what you put donw first so just a bit peeks out? I’ve found that is one of the secrets to effective layering. When I first began, I was loathe to cover up my favorite pieces, but I’ve since found that doing so is what makes a page intriguing. What have you layered with this months kits? 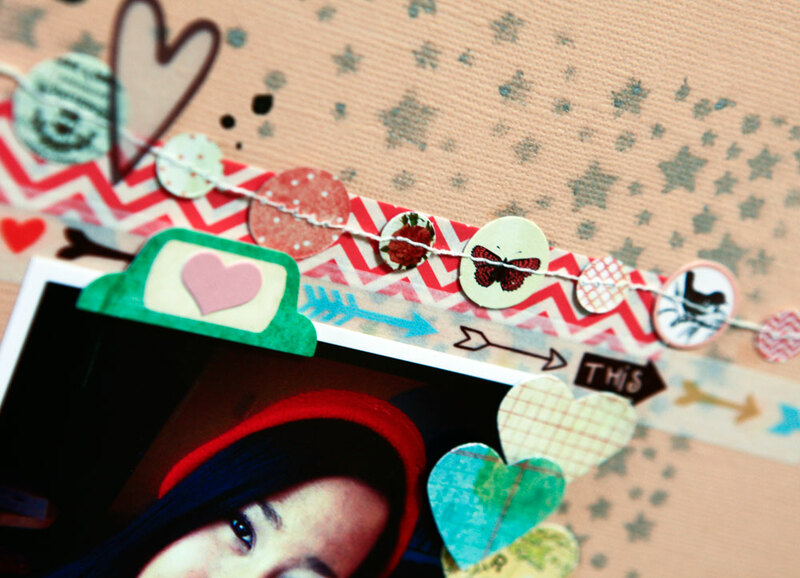 Make sure and share your latest Scrapbook Circle projects on our Facebook page. You never know, you may get ‘lifted’ by the DT! What do you make from kit scraps? Sometimes I like to make cards. Sometimes tags. But usually I love to make layouts. I like making layouts with the scraps and the last bits of a kit. Often it ends up being my favorite layout. In general I like the closed universe of creating from a kit–there are less decisions to make when you dont have to dig into your stash. And there are even fewer decisions to make when you are at the very end of a kit! 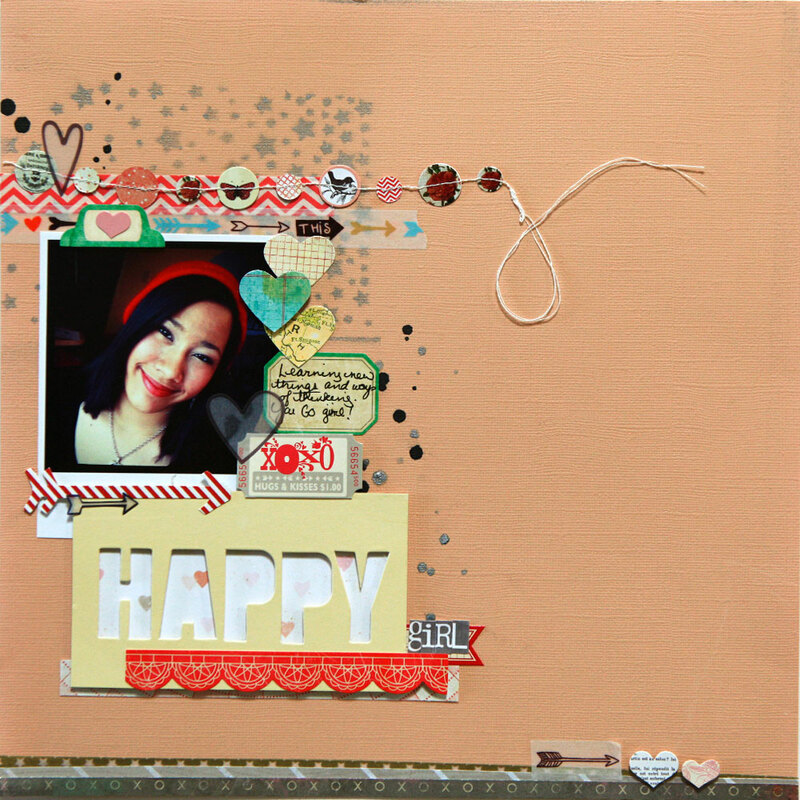 Here is the last layout I made with Scrapbook Circle’s January kit Only You. , and another at the bottom. Even the Scrapbook Circle kit scraps are fabulous! Thanks to everyone who played along with the January sketch challenge. Here are some of the amazing layouts that were made using the sketch for this month. Thanks to all of you who played along this month! We love seeing what you make with the kits. Hey guys! Today I’m sharing a layout with you that I created with this month’s kit – Only You. I really LOVED the colors in the kit this month! The colors are perfect for Valentines day projects as well as other themes too. I’ve had this photo sitting on my desk for quite awhile. It was taken the day my son was born – the first time his big sister met him. Such a sweet moment! I used lots of hearts and arrows on this page and I love how it turned out. We’d love to see what you’ve made with this month’s kit! Be sure to share on the Scrapbook Circle Facebook page. How is your entry coming along for our trendy arrow challenge? Need some ideas? Well, I have double the inspiration from our design team for you today! You can’t walk away uninspired after seeing how Jennifer and Jennie made their point. Jennifer used arrows in several places to bring attention to important details. Arrows focus your eyes on the photo, the date, and the title. Not only are the arrows functional, but also decorative and oh-so-cute! Jennie used arrows to focus on the center of her page. Birthdays are pretty exciting, and what better than a circle of arrows to bring that excitement to your page?! Great idea, Jennie! If you would like to join in on the challenge, you still have two weeks to play! Find all the details for entering here. Have a great day! Rebecca left four journaling cards intact and used the block like a patterned paper background. The grid houses her photos nicely. Rebecca also trimmed arrow accents from the printable to embellish her page. Have you printed out the January Printable? We would love to see how you are using it on your layouts and cards. Be sure to upload photos of your projects to our Facebook page and we will come take a peek. Have a great day!